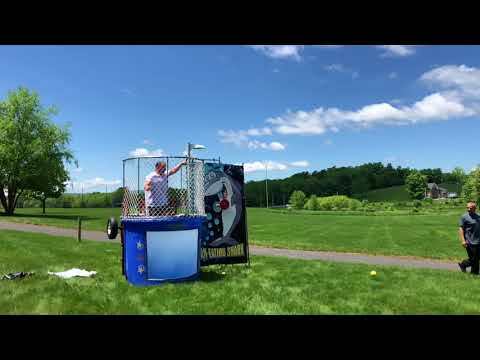 Marc Albanese taunts his colleagues by standing on the dunk tank seat. Does anyone get him? Watch to find out! It is with sadness and hope in the Resurrection that we announce the death of Merritt “Butch” Williamson, father of Jennifer Bunting. Services are Saturday, May 26 at the Bensing Funeral Home (2165 Community Drive, Bath, PA 18014). There is a viewing from 9:00-11:00 a.m. and a service at 11:00 a.m. Burial will follow at Bushkill Methodist. It’s DSU BBQ Employee Appreciation Day! It’s Employee Appreciation Day! Be sure to join us for this great day full of fun activities, food, and prizes. Don’t forget to bring your tickets for the Brown Bag raffle and your new toiletry donation for the DREAMS Program! Please be sure to stop and visit with our vendors — Highmark, Benecon, Liberty Mutual & BJs — in the DUC reception gallery to enter a drawing for a chance to win (4) Iron Pig tickets for June 2 (Fireworks Night) generously donated by Highmark. To assist with the on-campus living, the DSU BBQ Team is collecting the following new, unopened items for our DREAMS program: deodorant, toothpaste, toothbrushes, sunscreen, chapstick, feminine hygiene products, shampoo, conditioner, soap, contact solution, bath towels, socks, and wash cloths. The drop off location will be in the Dining Hall during the DSU BBQ on May 23. Each June, DeSales University sponsors the DREAMS program, which offers educational enrichment to Lehigh Valley high school students. Students learn the importance and obtainability of a college education. With a combination of classroom learning and community events, the students receive knowledge and hands-on experiences, all while living in our residence halls. Thank you in advance for your support! In celebration of the DSU BBQ’s 15th Anniversary, the DSU BBQ task force is throwing a WAY BACK WEDNESDAY contest. A prize will be awarded to the employee who brings in the highest number of DSU BBQ T-shirts since the first one in 2004. Bring your T-shirts to the lunch and the winner will be announced at 1:00 p.m. Good luck! Includes: Obstacle Course, Face Painting, Games, and Movie.